Stop Pain Before It Starts With Our Patented 5 Layer Technology & Cutting Edge Optron® Material. Designed & Engineered In Switzerland Using Our Clinical Research To Create The Most Unique Insoles In The World. ComfyWalk Insoles Will Help Eliminate Your Pain. Fast, Non-Invasive & Inexpensive, These Supportive Insoles Can Be Your Gateway To A Pain-Free Life. ComfyWalk Insoles Will Help You Recover Quicker As They Absorb Shock That Causes Pain To Your Feet, Ankles, Knees, Hips & Back. Enjoy Wearing High Heels Again With ComfyWalk Insoles As They Cushion Your Feet With Lasting Support For your Arches & Heels! 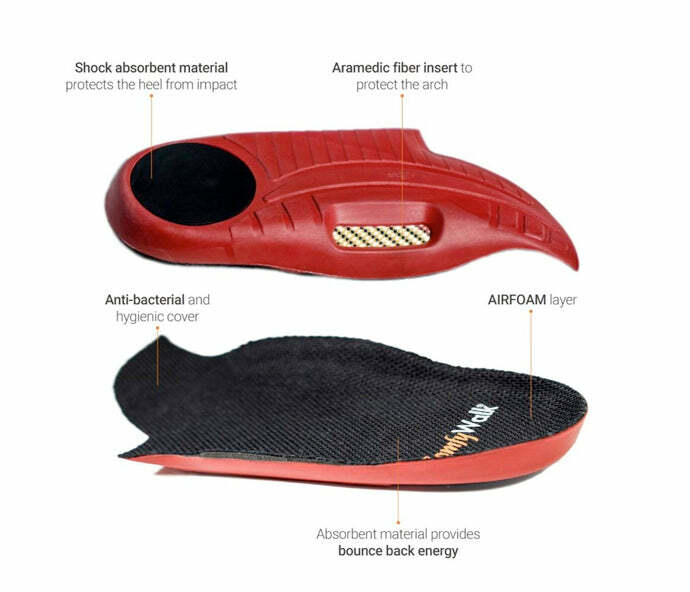 ComfyWalk Insoles are made of a unique combination of Aramid Fiber (commonly known as Kevlar), polyurethane, rubber and cushion foam. It also utilizes Optron®, our proprietary material that together with our revolutionary patented design of 5-layers provides immediate better posture, maximizes comfort of any shoe, absorbs negative impacts from walking or running and effectively helps reduce back and foot pain like no other insole. With our patented & revolutionary Optron® technology, no other insole in the world provides 5 layers of pain-reducing comfort. Each layer performs a specific function, effectively combining 5 insoles into 1. I have been looking for the right insoles to help me with my lower back pain and I finally found them! Recommending them to everyone! LOVING MY HIGH HEELS NOW! I wear high heels to work every day and it has taken a toll on my feet and back. I tried ComfyWalk and it has made a huge difference. The pain in my feet and back have gone away. I can't say enough about how ComfyWalk has helped me! Thank you! I have had terrible issues with plantar fasciitis and have tried many different products seeking relief. Only ComfyWalk has helped.